In July 1944, von Rundstedt was relieved of command in the Western front for expressing the opinion that the war was lost. This opinion must have been shared by the most of (the reasonable part of) Nazi leadership. The actual collapse of the Reich did not come until 10 months later, which is plenty of time to start thinking of 'what next'. In some cases (most notably in Iraq war), the military collapse of state was followed by prepared and pre-planned guerilla warfare. Granted, modern standards of avoiding civilian casualties make the guerilla/terroristic warfare far more efficient, but even back then, there were successful guerillas (most notably Yugoslavian), and even under as cruel a power as Soviet Union, and no external support, the Ukrainian and Lithuanian nationalistic militant undergrounds existed through the late 1950s. Preparing for guerilla warfare would be in line with Hitler's 'fighting till the end' stance, and for many Nazi leaders, it would be the only alternative to death by surrender and death by cyanide pill. The well-developed underground would probably increase their chance of survival (cf. Saddam who was not captured until 6 months after collapse of his regime). Given how difficult de-nazification was, they would probably enjoy large-scale support of all levels of devotion, including sympathies of the majority of the population. Still, I never encountered anything about planning and/or implementation of (preparation for) guerilla warfare. Were there people in the Nazi leadership who argued for that or tried to persuade Hitler? If not, why? Edit: It is true that Hitler did not appear to think he was losing the war until two days before committing suicide, and surely few would confront him after the July 20th coup about that. However, surely some of the Nazi leaders did, and to set up guerilla underground one would just have to convince Hitler that it would be a valuable preparation for defeating the Allies if they enter some parts of Germany, without need to talk about the overall defeat. So, the question as to why it hasn't been done or attempted stands. In late summer/early autumn 1944, Heinrich Himmler initiated Unternehmen Werwolf (Operation Werwolf), ordering SS Obergruppenführer Hans-Adolf Prützmann to begin organising an elite troop of volunteer forces to operate secretly behind enemy lines. Translation: Those who do not participate are against us! Werwolves!!! It's up to us. 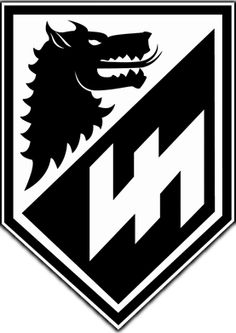 Image sources: Lobisomem (Werwolf), a resistência nacional-socialista pós-Segunda Guerra Mundial and Franz Chocholatý Gröger "Werwolf: Fakta a mýty"
No officially recognized effort was ever made by the Nazi leadership to develop an insurgency to continue fighting in the event of defeat, in no small measure because Adolf Hitler, as well as other Nazi leaders, regarded anyone who even discussed the possibility as defeatists and traitors. As a result, no contingency plans to deal with defeat were ever authorized in the official, public record. 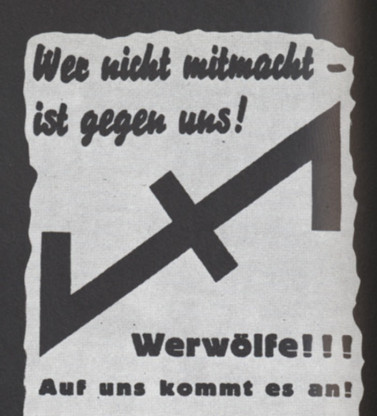 However, as a result of Goebbels' efforts, Werwolf had, and in many cases continues to have, a mythological reputation as having been an underground Nazi resistance movement, with some even claiming that Werwolf attacks continued for months, or even years, after the end of the war—-in particular, sources cited by West Coast radio broadcaster Dave Emory, for instance in this archived program on audio, following a brief first segment. Its perceived influence went far beyond its actual operations, especially after the dissolution of the Nazi regime. Notably Karl Dönitz expressly forbid any such actions on May, 5th 1945. How much influence his dwindling actual powerbase might have had, especially on fanatics from the SS or HJ might be a matter of debate. The general populace was by then primarily wary of the war as were the members of the Wehrmacht (who would have regarded this kind of behaviour as not honourable but despicable on top). Those were not in need to be told to not engage in irregular warfare, they already did not want to follow these Werwolf orders anyway. That all allied forces remained a bit paranoid about this seems understandable. They often suspected enemy action when there was just an accident. 31 July 1945 – An ammunition dump in Ústí nad Labem (Aussig an der Elbe), a largely ethnic German city in northern Bohemia ("Sudetenland") exploded, killing 26 or 27 people and injuring dozens. The explosion was blamed on the Werwolf organization and resulted in the "Ústí massacre" of ethnic Germans. Finally, we must briefly consider how the Werwolf influenced the nature of the occupation. Although it has been claimed that the prospect of Werwolf resistance caused the Western Allies to advance with 'unnecessary violence,'30 the unfortunate truth is that the threat of partisan warfare created a setting conducive to the abuse of ordinary folk, principally because the guerrillas attempted to hide themselves among civilians, and thus endangered all noncombatants. –– A final total of 3,000-5,500 dead ranks the Werwolf as a final drop in the torrent of blood spilled during the Second World War, but it is more significant if considered in its own right as an example of recent partisan warfare and terrorism in Europe. As for the geographic configuration of Werwolf activity, there is no doubt that long-time NSDAP strongholds such as the Thuringian Forest, the Lüneburg Heath, southwestern Saxony, Altmark, and Masuria all became trouble spots in 1945. In a few other areas that were also traditional Nazi bastions but were lacking in terrain features favouring guerrilla warfare, such as the Frisian coast, there was also evidence of heightened civilian hostility and sporadic resistance. Although it is impossible to prove conclusively, it seems as though central Germany posed more difficulties for the Allies than did the Rhineland; certainly, five of seven Bürgermeister killed by the Werwolf were laid low east of the Rhine, and, with several exceptions, nearly all other civil and party officials murdered by Werewolves similarly met their fates east of the river. Furthermore, most guerrilla ambushes of enemy forces occurred in central or eastern Germany. What is interesting, however, is the lack of sources suggesting that the Nazi leadership had carefully planned to exploit its political bases for the success of the Werwolf, or that their understanding of partisan warfare was sufficiently sophisticated to concentrate attention upon demographically favourable regions or population groups. Rather, the fact that German forces, including guerrillas, were eventually drawn to the Sauerland, the Thuringian Forest, the Harz, the Alps, or the Ore Mountains was due to the favourable terrain features of those areas and to the axis of Allied and Soviet advances and corresponding German retreats. Perry Biddiscombe: "Werwolf! The History of the National Socialist Guerrilla Movement, 1944-1946", University Of Toronto Press: Toronto, Buffalo, 1998, p 276. 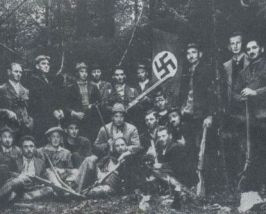 From 1946 onward, Allied intelligence officials noted resistance activities by an organisation which had appropriated the name of the anti-Nazi resistance group, the Edelweiss Piraten (Edelweiss Pirates). The group was reported to be composed mainly of former members and officers of Hitler Youth units, ex-soldiers and drifters, and was described by an intelligence report as "a sentimental, adventurous, and romantically anti-social [movement]". It was regarded as a more serious menace to order than the Werwolf by US officials. sixth and final factor mitigating against resistance was that the social and political climate of the Reich had conditioned several successive generations of Germans to regard partisan warfare as an illegitimate tactic. 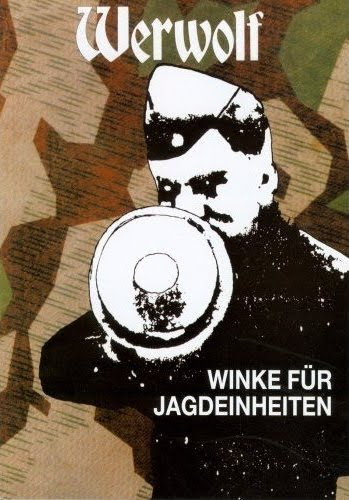 Werwolf propaganda desperately sought to reverse this belief by appealing to strong traditions of German 'popular' warfare, but, given the short time in which Werwolf Radio could influence opinion, it is hardly surprising that little was accomplished. In the final analysis, most Germans retained almost as much contempt for their own guerrilla fighters as for the 'bandits' and 'Reds' who had harassed the Wehrmacht. It would be incorrect to conclude, however, that Germans were unsuited for partisan warfare on 'racial' grounds, or even that the fundamental nature of German culture was somehow barren of such roots. And it should be expressly noted that most victims of this "resistance" were indeed Germans, not allied troops. Most prominent, and one of the few officially recognised successful operations, the assassination of Aachen mayor on March 25, 1945. This was done by a commando unit of six, among them two teenagers of 16 and 14 years, who paradropped behind enemy lines and shot the mayor Franz Oppenhoff. Goebbels seized on that success and proclaimed via radio that these actions would continue and from now on the Germans would change their prayers: "Hate is our prayer and revenge our war cries!" And on April 28, 1945 at Penzberg near Munich that last line from the Goebbels speech culminated in the murder of 16 people at once, among them a pregnant woman, as they were deemed defeatist. Some higher echelons of the Nazi leadership considered this guerrilla tactic for actions behind enemy lines during the war. Later those people even envisioned it to continue after –– 'a surely only temporary' –– defeat. Those guerrilla actions were put into action on a much smaller scale than envisioned at the time or even perceived by the Allies shortly after the war. Those who were active in these units or in their spirit were the most fanatical, that is: mostly SS and HJ members. Paper orders are one thing, but any guerrilla war needs a sponsor to supply weapons and ammunition and other supplies. If the Nazis did try to fight after the surrender, who would support them? How would they smuggle weapons into a nation occupied by millions of foreign soldiers? Which nation would dare supply a war where the enemy are the current word powers? Not the answer you're looking for? Browse other questions tagged world-war-two nazi-germany hitler strategy or ask your own question.